An abandoned mineral mine near Stanford University is providing geoscientists with new insights on how to permanently entomb greenhouse gas emissions inside the earth. For two years, a team of Stanford researchers has been trying to unravel a geological mystery at the Red Mountain mine about 70 miles east of campus and 30 miles southeast of Livermore, Calif. The abandoned mine contains some of the world’s largest veins of pure magnesium carbonate, or magnesite – a chalky mineral made of carbon dioxide (CO2) and magnesium. How the magnesite veins formed millions of years ago has long been a puzzle. Now the Stanford team has proposed a solution. Their findings could lead to a novel technique for permanently converting CO2, a potent greenhouse gas, into solid magnesite. The results will be presented at the 2013 fall meeting of the American Geophysical Union (AGU) in San Francisco. Power plants and other industries are responsible for more than 60 percent of global CO2 emissions, according to the International Energy Agency. Sequestering the CO2 in magnesite deposits would prevent the gas from entering the atmosphere and warming the planet, Maher explained. 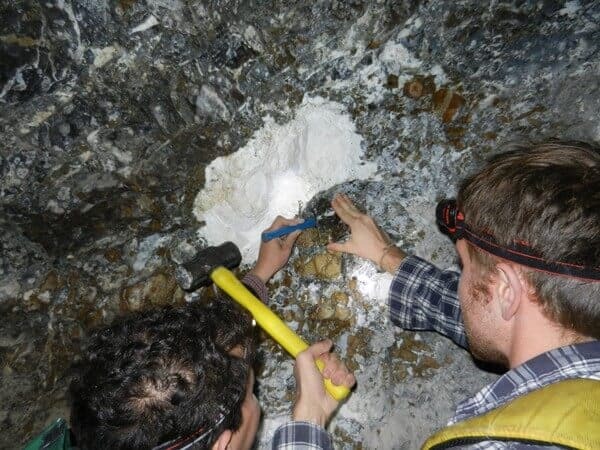 At Red Mountain, the Stanford team has identified more than 20 large veins of pure magnesite embedded in magnesium-rich ultramafic rock. The biggest vein is about 118 feet (36 meters) wide and 886 feet (270 meters) long. More than 50 percent of the magnesite in each vein consists of CO2; the remainder is magnesium. Ultramafic rocks make up about 1 percent of the Earth’s surface. Many locations are found near regions undergoing rapid population and industrial growth, Maher said. More than 50 other deposits of exceptionally high-grade magnesite are distributed in the California Coast Ranges alone. Sequestering CO2 emissions at these sites could play a significant role in curbing global warming, she added. California’s infamous San Andreas Fault lies less than 40 miles west of Red Mountain. The fault formed about 29 million years ago, creating a large gap between the Earth’s crust and the hot mantle below. The gap allowed heat to rise to the surface, raising the temperature of the water and liquid CO2 trapped in the ultramafic rocks. For carbon sequestration to succeed, scientists will also have to figure out a way to make ultramafic rock permeable. “There is no way that CO2 or anything else will flow through these rocks,” del Real said. He will discuss the problem of permeability at the AGU meeting Dec. 10, at 10:20 a.m. PT, in Moscone Center South, Room 301. Other Stanford collaborators on the project are professors Dennis Bird and Gordon Brown in the Department of Geological & Environmental Sciences. Support for the research was provided by Stanford’s Global Climate & Energy Project.